The BigJigs Sand Tower Set from the BigJigs Wooden Toy Railway collection at Wonderland Models. 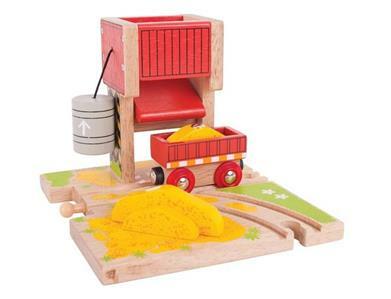 This brightly coloured Sand Tower track accessory features a working sand loading hopper and allows you to expand your BigJigs wooden toy railway layout! Also compatible with most other wooden railway brands!